Trace Adkins can add action hero to his list of career accomplishments. 12 Gauge Comics is planning a four-issue comic book series called “Luke McBain,” which is based on the country star. The first issue hits stores in November to coincide with Adkins’ tour. It will be available for $3.99 per issue in more than 4,000 comic book stores and other outlets. 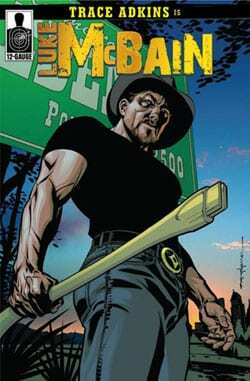 The story takes place when McBain returns home to rural Louisiana after serving prison time for a crime he didn’t commit. He wants to set things right in the town controlled by greed and corruption. Other music artists have been involved with the comic book scene including Gerald Way of My Chemical Romance and Tori Amos, but Adkins is the first country artist. Julianne Hough and her brother Derek are nominated for an Emmy Award for Outstanding Choreography. Their “Great Balls Of Fire” routine on Dancing With The Stars earned the nod. The 61st Primetime Emmy Awards will air Sun., Sept. 20 at 7 PM/CT on CBS. Sammy Kershaw’s “Louisiana Hot Sauce” was featured prominently in a recent Sunday night episode of HBO’s hit series True Blood. The song, written by Kershaw and Keith Stegall, appeared on his Maybe Not Tonight record that was released by Mercury in 1999. By Monday morning the track was one of the top downloaded tracks on iTunes.